Can you please ask your snail man how did the snails survive the flood and how would they have gotten around the whole world at snail’s pace afterward and formed the thousands of species in today’s world? Surely show evolution and continental drift is a better answer. The survival and spread of snails and their broader class the Gastopoda is better appreciated when we understand the character of the biblical kinds given in the book of Genesis. Only when we start with this biblical basis can we better understand the success of specific species and geographic isolation of others. Ten times in Genesis chapter 1 we read that God created the kinds. What is a kind? Broadly speaking it is the grouping of similar species that scientists refer to, using our current classification system, as families. There can be great variety in that family but it’s easy to see which family each species belongs to. The original replicators of today’s species had the genetic potential to reproduce the great variety we see today in those families. Once we recognise that today’s species are representatives of the original kinds we begin to see, contrary to Darwinian thought, that many of the qualities, characteristics, strengths and weakness are either lost, isolated or separated out through speciation. 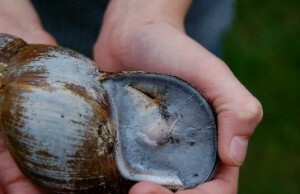 Snails are split into two very broad categories or orders – the Pulmonates which breathe using a pallial lung being mainly land based (although some can be found in freshwater and some in the sea), and the Prosobranchs which use gills to breathe being mainly marine (although some can be found in freshwater). Let’s not forget that in the beginning the number of species (being representatives of the kinds) would have been smaller and prior to the flood speciation would have had around 1656 years to develop. Some snails are amazingly designed to survive climatic changes by entering a phase of dormancy known as aestivation or hibernation. Conditions during the flood may have induced many of the gastropods to one or either of these states. 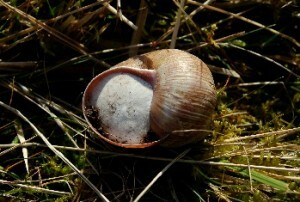 The onset of drought or cold temperatures stimulate many snail species to seal the aperture of their shell with a thin layer of mucous that dries called an epiphragm. It is therefore highly likely that the land based snails spent the majority of their voyage roosting on the eves of the ark, sealed up and asleep waiting for the flood waters to recede. Photo: Cornu aspersum aestivating against a Buddlea bush during dry summer conditions. Most of our land based Pulmonates are detritivores and so any active specimens during the voyage would have survived on detritus material which we can imagine would be abundant on a boat loaded with animals. Any food stuffs provided as feed for the other livestock would have sufficed for the various kinds represented. Freshwater Pulmonates would have lived through the flood resting on floating timbers and vegetation. During the recessional phase of the flood as the waters drained back in the new ocean basins many of the freshwater species could well have been left behind in lakes enabling their kind to colonize new ecological niches. The Prosobranchs (sea snails) would have survived perfectly in the ocean. The term ‘snail’s pace’ is quite misleading – they can actually achieve great ends by their ‘paced progress’ covering considerable distances. Several striking factors favour their spread and survival and by looking at these we can begin to see how different species have covered great distances since the flood, setting up camp in specific habitats which can prove either favourable or unfavourable to their settlement. One of the chief agents that has literally carried snails across the continents is man – whether accidently as cargo tucked away amongst man’s possessions and/or in some cases quite deliberately introduced to foreign soil as a food source. 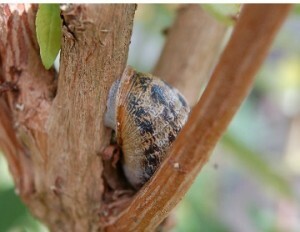 Land snails have this unique habit of crawling into and resting in the most difficult of recesses. The great success of the Giant East African Snail has been it’s propensity to hide amongst all manner of materials – some have been intercepted at ports tucked away among bunches of bananas in Micronesia, and others in freight from flower pots sent from Mauritius, to infestations among orchid shipments bound for Java in Riouw Archipelago.(1). Above Left: The Garden Snail (Cornu aspersum) collected from a back garden in Wigston (UK). 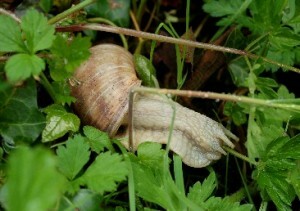 Above right: The Roman Snail (Helix pomatia) found chomping through the petiole of Cow Parsley (Anthriscus sylvestris) in Surrey (UK). The rearing, cooking and eating of snails has also led to species being spread far and wide. It is highly likely the ancient Romans brought snails with them to England for food. The ‘Roman Snail’ (Helix pomatia) – a European species is now protected under the Wild Life and Countryside Act partly because of its notable size and edible qualities. Another snail – the Garden Snail (Cornu Aspersum) is also regarded as a Roman introduction colonising vaster areas of the country. The snail’s ability to survive adverse conditions through either aestivation (which can in some cases be months without food or water) or hibernation can enable some species to restock existing populations even if predation or other pressures have depleted old stocks. Above Left: The hibernating Roman Snail sealed with an epiphragm impregnated with chalk. Above Right : The shiny muco-calcareous epiphragm of Achatina fulica. Notice the grooved slit (see arrow) which covers the pneumostome or breathing pore, enabling the snail to respire while sealed up. In studying hibernation in the Roman Snail we see further marvels of God’s design. After excavating a hollow and pulling in surrounding vegetation the snail produces an epiphragm which is reinforced with chalk. As the snail retreats further into its shell it creates a cushion of air, providing added protection from freezing temperatures. This and other incredible physiological changes enable this European sun loving species to endure the bitterness of the British winter. Some specialist species can be limited in their distribution, requiring specific environments whereas other species are more generalist and therefore are not as confined or restricted in their choice of habitat. The ability therefore a species has to tolerate the extremities of climate can greatly effect its distribution and vice versa. 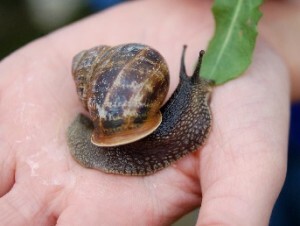 In the UK we have seen the rapid spread of the Girdled Snail (Hygromia cinctella). This is a Mediterranean species, yet has found a home in England. It was first reported in Devon in 1950 and has now covered many areas in the south. A few miles from where I live just south of Leicester, the country estate of Evington Park recorded the presence of the species in May 2012. Depending on the species, snails can lay anywhere from one single egg at a time as seen in the family Acavidae, to over a hundred (Achatina fulica). Some species are ovoviviparous with the eggs hatching inside the adult to emerge as fully formed hatchings. This ability can help shield the developing eggs from predation and any detrimental environmental changes which in turn can have an impact on the spread of a species. Achatina fulica is a phenomenal breeder. According to Professor Al Meade (1) an individual snail becomes sexually mature nine months after hatching. That snail can then produce four batches of eggs comprising of 150 eggs to each clutch. If each of the hatchlings survived and successfully bred for a further five years we would be looking at 16,121,432,399,695,050 snails – that is over 16 quadrillion individuals. Pressures from predators can work for or against dispersal. Certainly when we look at an isolated species we can see how the influence of predation can lead to their success or failure, or in some cases extinction. This is not a world evolving but groaning as the apostle tells us in the book of Romans (2) longing to be set free from the corruption brought through man’s rebellion. We see this powerfully played out in French Polynesia with the success of two introduced species, which in turn led to a rescue mission to save a large genera of endemic species under threat of extinction. After many unsuccessful measures taken against its advance of Achatina fulica, biological control was employed in the form of another snail – the carnivorous Rosy Wolf Snail (Euglandina rosea) which decimated the endemic Partula snails. 50 Partulids have since gone extinct with 11 species now kept and cultured in captivity. The hallmark of the created kinds is their great variability which powerfully impacts their distribution. Islands are a great place to observe this variation. They are not living laboratories of evolution, rather living examples of the great variation in a given kind that can develop in an isolated setting, which of itself can contain a range of environments all bearing on the development of a species. Henry Crampton studied Partula that live on Moorea believed that his work like Darwin’s on Galapagos might explain how species evolve. Yet of the 123 different species of Partula snails we do not see any evolution whatsoever. What you do find is the great diversity of the genus spread over some 5000 square miles from the Society Islands in the Pacific to Palau highlighting the incredible distribution and variability of this kind. The conflict we see is not with the facts but with the philosophy which at its roots and all the way to its rafters is a rejection of God’s revealed history given in the book of Genesis. No one has seen any snail evolve or the continents drift apart. The real question we must ask ourselves is not what is better, but what is true? Charles Darwin had an idea – we have the revealed word of God that clearly reveals to us not just when God made the heavens and the earth but how. That is the real nature of the conflict. Given the record of Genesis we can actually see how the real character of the kinds has enabled their colonisation in a relatively short period of time and how their development is not an upward struggle but downward and devolving from their post flood forms, with various species hampered by limiting factors to their success and regeneration. The success of snails is down to God’s sustaining power and provision. When you consider the great pressures facing them from predation, pollution and loss of habitat it is a wonder we have any at all. Yet we see in and beyond their marvellous design how God is securing their survival and success. Why? They, like all He has made, are here to declare His glory. This is why Noah was told to bring two of every kind, seven of some to enter the ark. Creation is a living testament which leaves none of us without excuse. Kept by the King of Kings, given for glory – that is the cry of creation from the smallest, all the way to the greatest of all that He has made. Special glory is set apart in mankind whom God made in His own image. It was for man who bears that glory that Noah set to build the greatest ship of all time in order to rescue him from the great judgment that was to come upon the earth. But then we have to marvel at the marvel of marvels, for it was through this rescue plan that God was to enter the world in the person of Jesus Christ of Nazareth to provide redemption for fallen humanity. Man was kept by the King of Kings for the King of Kings Who would later lay down His life and open the way back to God. What an incredible picture we see unfolding. And even today, man is still kept by that sustaining power, that he might repent (change his mind) and believe on the Lord Jesus Christ and be saved from the wrath to come. Dear reader is that true of you? Have you responded in repentance (a change of mind) and faith towards our Lord Jesus Christ? We were made for His glory and only through Jesus Christ can we be redeemed from the ruin that our sin is making of us and avoid the punishment of hell that our sin so deserves. God though is not willing that any perish but that all come to repentance. That is why we are kept in this broken world, that we might come to know Him Who is life eternal through repentance and faith. Therefore we must give the more earnest heed to the things we have heard, lest we drift away. For if the word spoken through angels proved steadfast, and every transgression and disobedience received a just reward, how shall we escape if we neglect so great a salvation, which at the first began to be spoken by the Lord, and was confirmed to us by those who heard Him, God also bearing witness both with signs and wonders, with various miracles, and gifts of the Holy Spirit, according to His own will? Simon Terry became a Christian when he was 18 after reading about Jesus Christ in literature he had received at a gospel meeting in his childhood. After qualifying with a Bachelor of Education degree (BEd) in the year 2000 from the University of Wales College Newport he joined the London City Mission working mainly amongst the youth and then later in community outreach. For three of those years he also supported a ministry in Covent Garden amongst those who believe in the new age philosophy using a literature table and attending festival events with a larger literature stall. In 2007 he left London for Leicester to join Answers in Genesis UK/Europe as a speaker for the ministry. Since 2009 he has been working as an evangelist in four parts of Leicestershire concentrating his time on door to door evangelism on the four districts and a literature table in his local town centre. 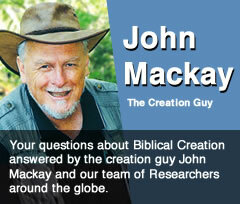 He is currently working on a book for this work entitled The Big Questions of Life Answered and still takes the opportunity to speak on the subject of creation. Simon is married to Yvonne with two children. Simon’s long term interest in slugs and snails stems from a childhood fascination. Their distinctive design, variability and extraordinary way of life have greatly intrigued him. Around 2003 he began studying the autecology of the land snail Helix pomatia in the south of England and hopes one day get his work published giving the glory back to the Creator in a field dominated by Darwinian thinking.